Chances are that it’s cold where you are and that you will be tired and (dare I say) hungover after New Year’s Eve. Make a pot of Ranch Style Chili a day in advance so you can relax, watch football and still have something good to eat with minimal effort. My family grew up calling this Ranch Style Beans. I’m sure there is a trademark infringement in there with that title and I’m baffled that my dad did not order us to cease and desist. 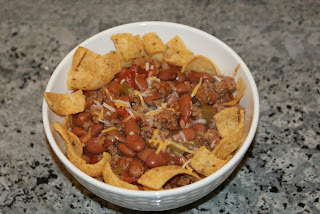 So let’s call it Ranch Style Chili with a nod to a great Fort Worth, TX company. 1 can stewed tomatoes (15 oz) – I use the petite diced tomatoes because it’s smaller chunks for the kids to eat so less complaining. Another reader uses Rotel tomatoes - you get the tomatoes and jalapeno too. 2 cans Ranch Style beans (30 oz total) – there are various flavors to choose from. I like original but if you want more of a kick, try the jalapeno version. Brown items #1-3 in a skillet. Drain the grease from the cooked meat. Add the cooked meat to a large pot containing items #4-8. Simmer for 1 hour (this will soften the green pepper and onion (if you choose to use the real thing and not the powder)). To serve, my kids like a layer of Fritos, then spoon on the chili, then sprinkle grated cheese on top. Chopped onions might be good addition too. Our friend, Samantha, served this as an appetizer the other night at her house. It’s one of David’s most favorite dishes so I had to make it again. 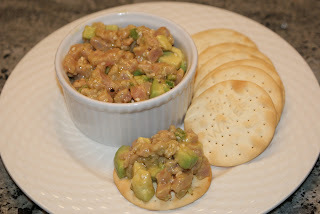 If you are going to a dinner or a party sometime soon, offer to bring the appetizer and wow your friends with this one. The guys at Rex’s Seafood will even dice the tuna for you (if you ask nicely and they aren’t too crowded). The proportions for the online recipe and the one in her Barefoot Contessa Family Style cookbook are wildly different (aka, 50 servings using 3 ¾ lbs of tuna vs 6-8 servings using ¾ lbs tuna) so plan and measure accordingly. Serve on water crackers. Delish! 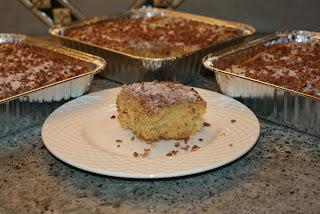 My mom’s coffee cakes have been a staple of family and friends’ Christmas mornings for almost 40 years. One year we were running late on deliveries (I must have been with her) and Kathy and Chris were waiting in the window. As they opened the door they exclaimed “we thought you weren’t coming and that we would have to buy a Sara Lee!” If you’re not fortunate enough to be on my mom’s delivery route, bake one for yourself (and 2 friends – the recipe makes 3 cakes) – who doesn’t love the idea of eating cake for breakfast and it makes your house smell great too! Merry Christmas morning (or any morning, really)!! 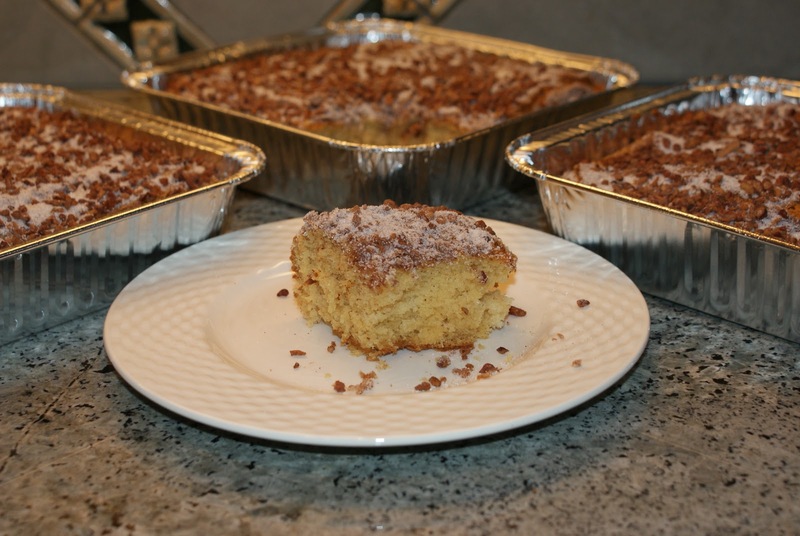 This recipe makes 3 cakes (either 9 inch round or 9 inch square pans). If you halve the recipe, use a 13x9x2 pan. Your call but I think it’s much more fun to bake and share! Blend with a mixer items #1-2. Add items #3-4. Make sure all ingredients are evenly mixed. Slowly (so the flour doesn’t fly all over the place and make your kitchen too messy) add the flour, baking powder and soda (#5-7) then add the vanilla (#8). 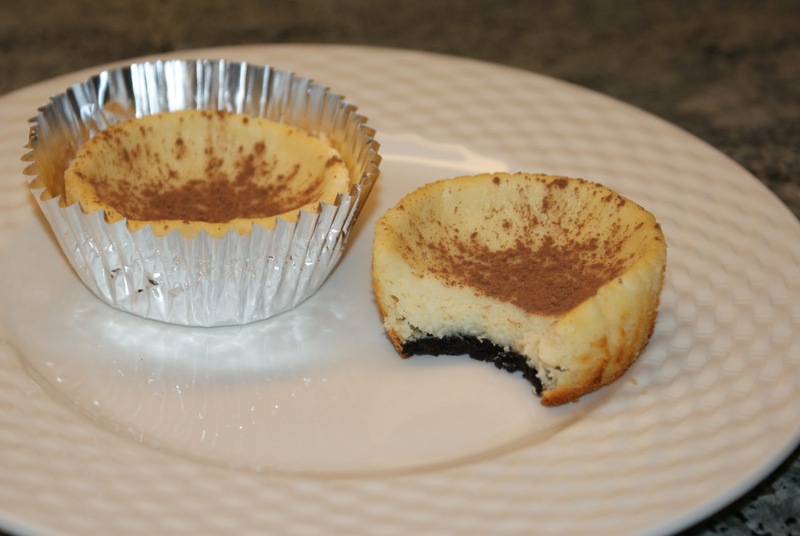 Separate batter into the 3 cake pans (disposable are better if you plan to share) and spread evenly in pan. Sprinkle nut mix on top. Bake in oven at 350 for 35-40 minutes. If you make the single cake, then spread half the batter and top with half the nut mix. Pour on the remaining batter and top with the remaining nut mix. This gives you a nice cinnamon-sugary-nutty layer in the middle of the cake. Love you Mom - thanks for letting me share one of your signature dishes! Brisket used to scare me. Would it be a dry, chewy lump when I was through? 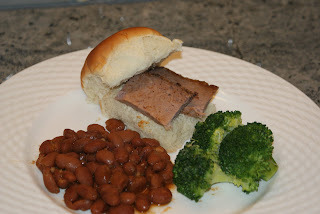 Then my friend Carol shared her friend Sally’s brisket recipe and I am scared no more. It’s kind of hard to screw up. Because most briskets are 4 lbs minimum, this is great for a crowd or for a few meals during the week. Take note: it takes 6 hours to cook so plan accordingly but it’s worth it (and it’s not as if you’re standing over the stove or grill the entire time). Have you ever had the brisket tacos at Taco Diner? Use this brisket meat and you can have that tasty treat at home. Preheat the oven to 275. Place brisket fat side down in a roasting pan. Pour one can of beef broth over brisket. Then pour one jar of Woody’s Cook n Sauce over brisket (make a nice “blanket” of sauce over the brisket). Cook 3 hours uncovered. Turn it over (fat side up) and cover tightly with foil. Cook for 3 more hours. Once cooked, slice the fat off the top of the meat. Slice the beef and pour the liquid/sauce in the pan into a container. 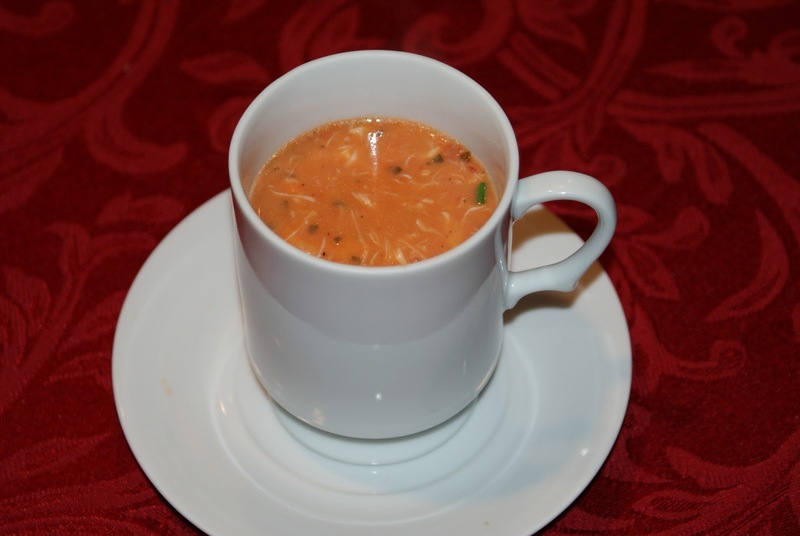 Place the sauce in the refrigerator; when cooled, the fat will rise to the top and then skim the fat off with a spoon. Pour the sauce over the sliced beef to keep it moist and flavorful. 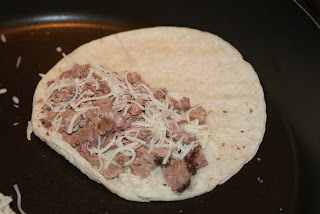 For brisket tacos, chop up brisket into small pieces. On a white corn tortilla, mix/layer brisket and Kraft Mexican style Authentic cheese - it's a combo of queso quesadilla, asadero and manchego cheese. Fold over tortilla to make a half-moon shape and place it on a warm saute pan/griddle to melt the cheese and make the tortilla slightly crisp (sometimes I have to place a spatula or something on top of the tortilla so it doesn't unroll. Flip over the filled tortilla and warm the other side too. Cut into thirds. Serve with avocado slices. The kids give it a "muy bien" rating. It's starting to feel like the "week of parmesan". Nevertheless, I'm constantly seeking new ways to transform a vegetable into something that the kids will eat. Barefoot Contessa (you'll learn that she's my favorite - my friend, Carol, and I stood in line for 2 1/2 hours to get her autograph on her new cookbook. I know but she's as darling in person (10 seconds) as on tv and in her books.) 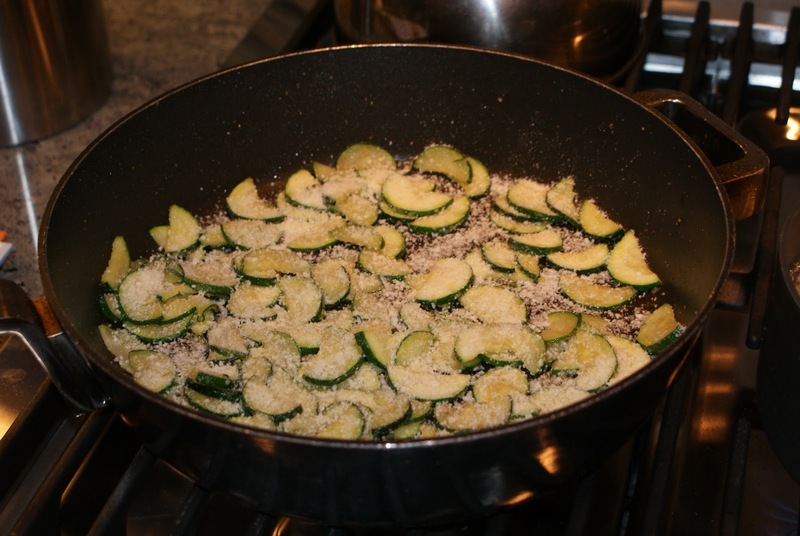 Anyways, she has a Zucchini Gratin recipe that I make often because the parmesan creates a crispy crust on the zucchini so I'm banking on the fact that maybe the kids will think the zucchini is fried. Here's the link to Ina's original recipe. I've adapted it slightly and use onion powder because the kids are going to turn up noses at real, chopped-up onion pieces. Cut the ends off the zucchini. Slice into coins (about ½ inch thick) or you can cut into half moons. Pour the olive oil into the sauté pan over medium heat; add the onion powder. 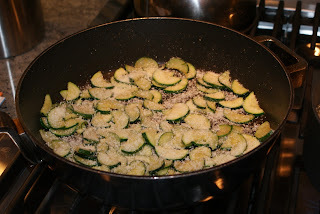 Add the zucchini slices and cook until they start to brown and soften (add salt and pepper to taste). 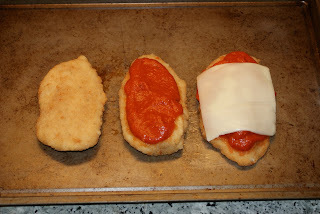 Once cooked through, sprinkle the parmesan on top and serve once the cheese has melted (about 30 seconds). 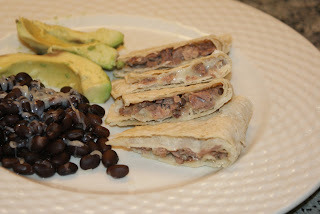 Quick – you just arrived home from work or piano lessons or soccer practice and you’ve got to get dinner on the table. What do you do? 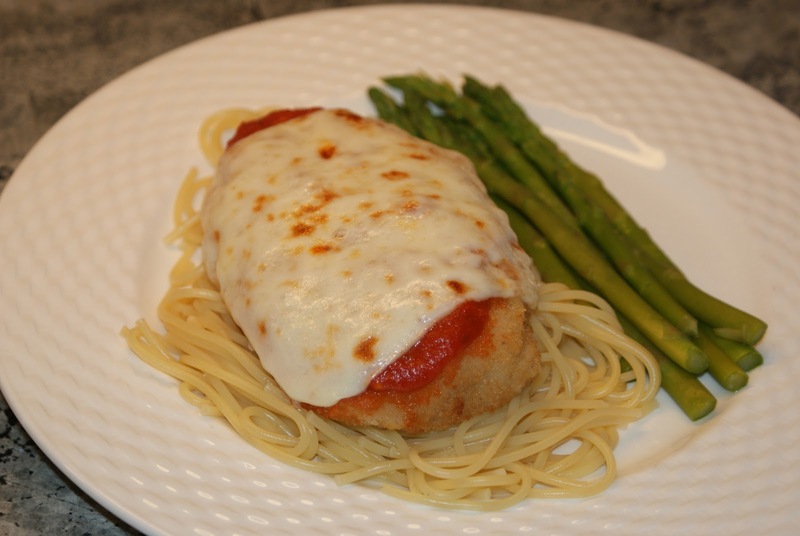 Head to your freezer and make Chicken Parmesan. 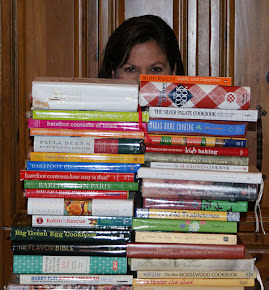 It is not labor intensive and you can keep most items stocked in your pantry and freezer. 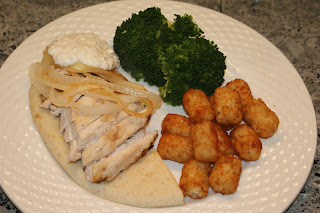 My kids give this a “Mom, I love this dinner” (which is not a daily exclamation) so enjoy! And don’t let the asparagus fool you – the kids don’t eat that. Preheat oven to 375. Boil water for spaghetti. Bake chicken at 375 for 25-30 minutes until chicken is cooked to at least 170 degrees*. While chicken is baking and there’s about 10 minutes left, cook the spaghetti for about 10 minutes. When the chicken is done (to at least 170 degrees - this is important because (a) you don’t want to get anyone sick and (b) Bell & Evans chicken breasts are raw – they are not pre-cooked), spoon pasta sauce on top of baked chicken breast. 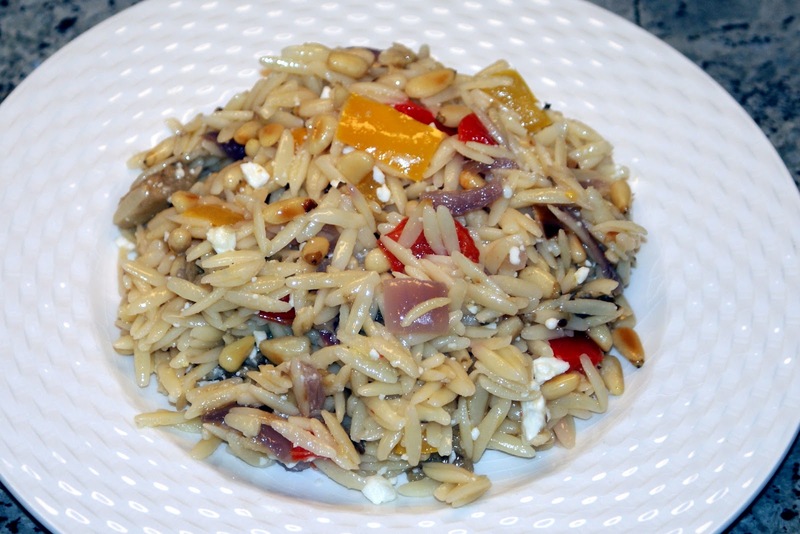 Top with a slice of mozzarella cheese. 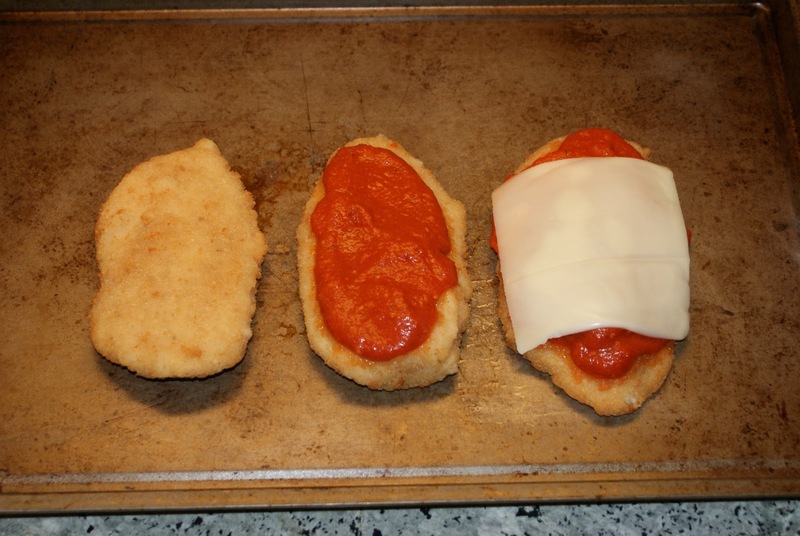 Return chicken to oven and place under broiler until cheese melts and starts to turn brown and bubble. Serve the chicken parm on top of spaghetti. * meat thermometer - I love my meat thermometer because I'm spastic about cooking food to the proper temperature. I use the Maverick Redi Fork Pro. I purchased it at Barbecues Galore but Bed Bath and Beyond has it as well. 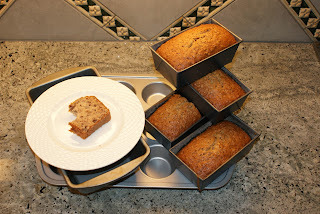 I secretly enjoy when the bananas start to turn brown – as if I need an extra excuse to make Uncle Willy’s banana bread. You may not know Uncle Willy but meet him once and you’ll start calling him Uncle Willy too. This recipe is so easy. You throw all the ingredients into a mixing bowl and then just turn it on. The kids like to make it with me, especially chopping the nuts. I’ve baked it in a loaf pan, as mini-loafs and as muffins. My favorite is mini-loafs – you get a lot of great crust, you have extras if you want to share with a friend or neighbor (perfect during the holidays to share with a party host – one for them, 3 for you! ), and they cook faster than a standard loaf. Muffins are even faster but it’s more work to fill all those muffin cups. I typically make it with pecans but try it with walnuts – you may never choose to buy a slice from Starbucks again! Combine all ingredients in large bowl and mix well (I use a standing mixer and the wire attachment). Transfer to pan(s) - various options below. For a traditional loaf (9x5), preheat oven to 325. Grease and flour loaf pan (spray with Pam then coat with flour; shake off excess – or spray with Pam Baking. Bake until top is golden brown and splits slightly (about 1 hour and 20 minutes). 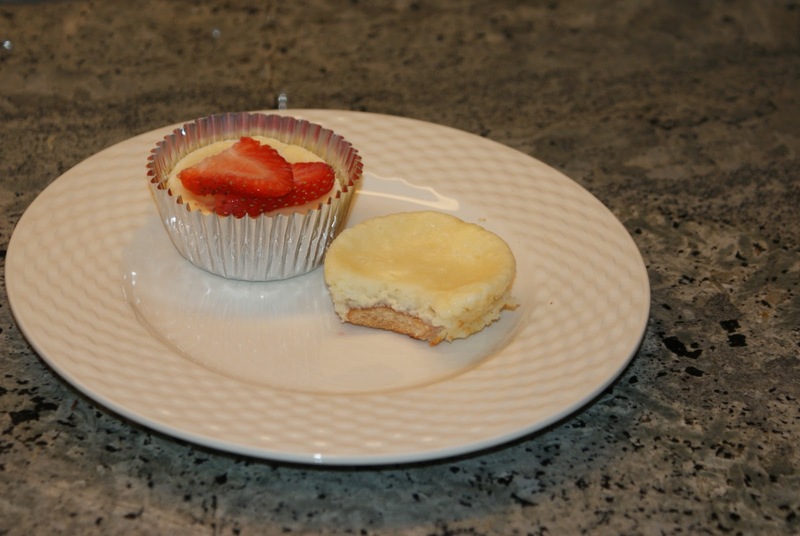 Test with a toothpick or skewer or something to ensure that the middle is completely cooked and not gummy. For mini-loafs (set of 4), grease and flour pans (see above). Preheat the oven to 325 and bake for 45 minutes. For muffins, preheat the oven to 400, line cups with paper liner or grease and flour (see above) and bake for 16 minutes. 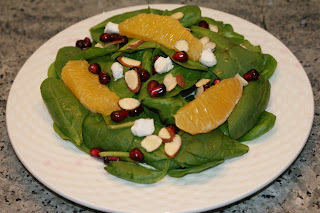 Last week, my friend Jolie calls from Whole Foods and says “I’m supposed to bring a salad for a dinner party tonight – what should I make?” I thought of this salad that we made at another friend Alyssa’s cooking birthday party a few years ago – it’s a great winter dish because pomegranates and oranges are in season. You can make your workload as simple or as complex as you choose so you don’t have to wait until a dinner party to make it. Even the guys liked it! 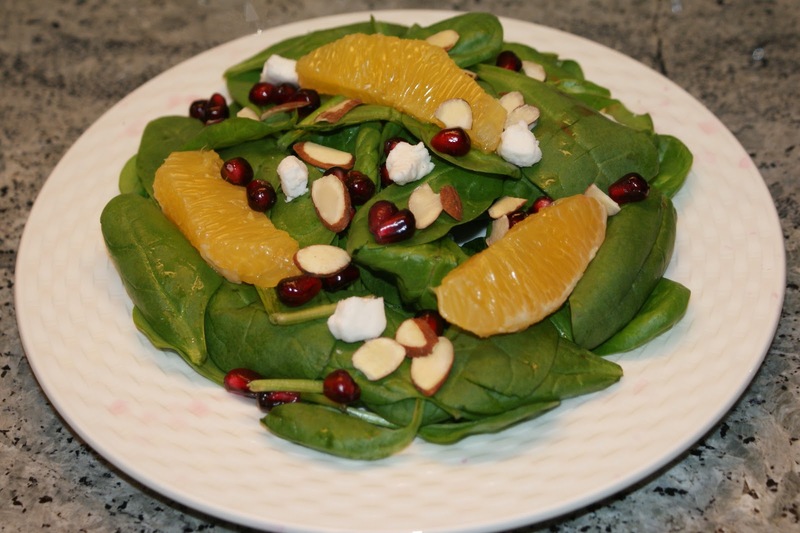 Rinse and pat dry spinach. You can seed your own pomegranate - (hint: don’t wear a white shirt while doing so) or stores like Whole Foods have containers of pomegranate seeds. For the oranges, you can either make your own orange segments or just drain a can of mandarin oranges. To make orange segments, peel the rind from the orange, segment, remove the membranes from each segment, and then slice into bite size pieces. To toast almonds, either place in a sauté pan on low heat or on a cookie sheet and broil in the oven. It makes the almonds taste nuttier, they are crispier and less soggy when mixed with salad dressing. Sprinkle goat cheese on top, if desired. What is your favorite Balsamic Vinaigrette dressing? Bottled or your own recipe. Post a comment and share your favorite!